Grand Vitara is a Sports Utility Vehicle or SUV car. This car serves all the basic requirements of a SUV right from the look to the basic design. It has stylish looks with colored bumpers on each side. The wheels of the car made of alloy with steroid-pumped wheel arches which gives the car a unified look. This car is generally used for long distance journeys. It has good leg room capacity. The boot capacity of this car can be increased to 1386 from its normal 398 liters capacity. This car has a great pick up capacity of about 100 kmph in 9 seconds. The car has wheelbase of 2640 mm. Lots of features have been installed to ensure safety and good control of the driver over the car. This car has engine of 1995 cc. There are 2 variants of this car with 1 engine and 2 fuel types. 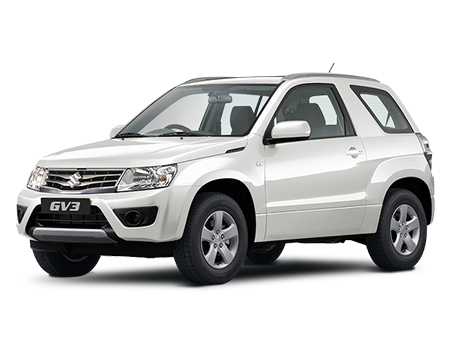 Maruti Suzuki Grand Vitara - compact SUV or an off-road vehicle has taken the brand legacy to a new paradigm. It was introduced in the year 1988 and presently it is running into its fourth generation. In other automobile markets, it is referred with different nameplates such as Escudo, Sidekick and Vitara. With its newly designed radiator grille and sporty front bumper, this SUV is all set to head the roads of machismo and style. The flared wheel-arches employed with 17-inch alloy wheels depicts its extremely tough and robust character. Its side facade is enhanced with body colored exterior mirrors mounted with turn indicators and door handles. Equipped headlight cluster and fog lamps improvises your visibility. It comprises impressive exterior dimensions measuring as 4500 mm x 1810 mm x 1695 mm (L X W X H) with wheelbase of 2640 mm. What to opt for: The exclusive compact SUV by Maruti Suzuki is equipped with various parts, thus insuring all the parts by complete vehicle insurance would lead to a smart action. Re-crafted interior of new Grand Vitara reveals the touch of true richness. This SUV is blessed with Multi-information display and a premium 6-CD changer along with AUX-in jack and center speaker over the dash. To increase the convenience quotient, Grand Vitara is provided with sliding centre armrest, digital AC controls and responsive power steering integrated with audio controls. The appointed automatic air-conditioning system and ac-vents enable you to enjoy a pleasant drive. For storage, this car has got 398-litres of boot compartment which can be expanded up to 1386-litres. What to opt for: The appointed premium inserts such as air conditioning, audio system are required to be insured, so the complete insurance of your vehicle will be good solution. In addition, the consumable add-ons will also be beneficial. The internationally acclaimed car, Maruti Suzuki Grand Vitara with its high-responsive dynamics and enhanced features is bound to take you on delightful ride. The list of its strong competitors includes Toyota Fortuner, Honda CR-V and Hyundai Santa Fe. For confidence and assurance, the available liable and collision coverage will cater its customer in an effective manner.